Johannesburg and Pretoria Country hotels offer a happy escape from the city. Golf courses, outdoor activities, top class restaurants and health spas all reign supreme in this region. Any of these country estate hotels makes a beautiful wedding venue , an unforgettable banquet setting or a memorable conference choice. Pure, unbridled, hedonistic luxury is what country hotels in Pretoria and Johannesburg are all about. Whether you are looking for a five star country guest lodge in tranquil surrounds or an upmarket country hotel near the bustling cities of Pretoria or Johannesburg, Gauteng has the right accommodation for visitors who appreciate the pleasures of life. These country estate hotels in Pretoria and Johannesburg provide a luxury escape for golfing or fly-fishing holidays for discerning travellers in pursuit of the finer things in life. In some instances, over the top opulence. 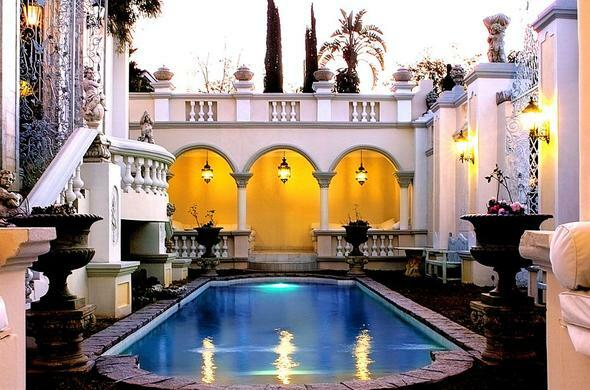 With 5 star services and exquisite romantic accommodation, Johannesburg and Pretoria country hotels offer newly-weds and honeymooners a taste of heaven, in some of the most sensuous, "deliciously decadent" rooms in Gauteng, South Africa. Gauteng, the commercial powerhouse of South Africa, is fast-paced and relentless. Conference venues in Pretoria or Johannesburg are pressurised affairs. Change all that by hosting your Johannesburg or Pretoria conference at one of these fine Gauteng country venues.